A Different Type of Risotto! | What Smells So Good? Let's go to The Ex... da da da *hums away merrily to herself*... unfortunately, that means Summer's almost over! *sob*. I know, I know, I'm as bad as the stores! Here it is still part of what has been a sunny, hot, humid, beat-yourself-to-death-with-a-hose summer and I'm posting FALL FOOD!!! Though, today I'm within every right to post warming food, because, let's face it, it's chilly out this morning!! But really, Fall? What will it be next, Thanksgiving recipes? Hallowe'en? Oh my Goodness... CHRISTMAS?? I promise I'll try to lapse back a little bit so that I'm not progressing through the year as fast as the local retail chains! I proceed to show you what I think of as a fancy fruit rice pudding. 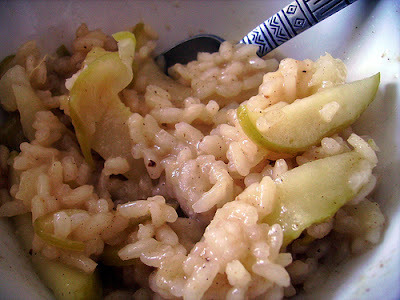 This is a splendidly flavoured dessert risotto flavoured with truly Canadian maple, apples and cranberries. Perfect for warming up after a walk in the chilly Fall air. A bit of work, but well worth it! In a small bowl, cover dried cranberries with boiling water. Set aside. Warm milk, cinnamon and salt to just under boiling point. Cover and set aside, keep warm. In a heavy, deep sauté pan warm oil over medium heat. Add apple and cook, stirring frequently, 1 to 2 minutes. Add rice and cook, stirring constantly, 30 seconds. Add 3/4 cup apple cider and cook, stirring, until most of the liquid has evaporated, 1 to 2 minutes. Add the remaining 3/4 cup of the apple cider and cook, stirring, until most of the liquid has evaporated. Add 1/2 cup of the milk to the rice mixture and cook, stirring frequently, until almost all of it has been absorbed. Continue cooking and stirring, adding remaining milk, 1/2 cup at a time, until the rice is tender and creamy. Drain cranberries and stir into risotto, along with vanilla and maple extracts. Serve warm with maple syrup, if desired. This is definitely a special dessert, and one perfect to end (or begin!) a romantic night with your sweetie. 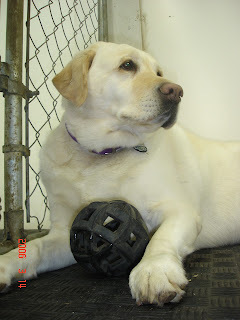 I do wonder whether Andrew would like this, I could make it for him, Martha and my dad one night after we walk their puppies (that's my lab Brandy Boo at Daycare in the pic). This is a bit on the caloric side, though, at around 400 calories and 6 g fat per serving, so if you do go for that walk with your idyllic mate (or puppy), make it a brisk one! PS: The WHB round up is posted here at kochtopf! This is definitely a different kind of risotto!!! Looks and sounds delicious Sarah. My dad would probably love it!!! He loves rice pudding!!!! Yum, I love different risottos. And I know how you feel--last week I made a truffle risotto and lamb meal and I felt like I was pretending it was winter!! This looks great! I have never really tried a sweeter desert like risotto. I am bookmarking this to try.